Josefina's Old Gate is another place down in Old Mesilla, the historical village just south of Las Cruces. We seem to be spending more and more time biking or wandering around the village, which has plenty of shopping, galleries, a crafts market on Sunday and Wednesday afternoons, and music on the Plaza. I'm especially fond of biking slowly along the back roads, looking at the old adobe homes and peeking into their gardens. Let me tell you, the place just oozes charm. It is so charming at Josefina's, that I believe you could serve me just about anything out on the patio and I would be thrilled. 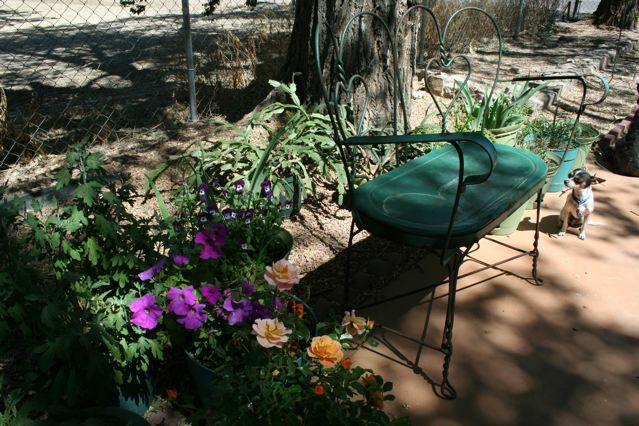 It is everything that I want my patio at home to be--shady, peaceful, filled with flowers, trees, and the sound of water fountains and birdsong. Although the menu is pretty short--Josefina's calls it "simple"--the sandwiches, soups, and desserts are fresh, delicious, and carefully prepared and served. The atmosphere is so relaxing that you feel you have all the time in the world to sit and chat and munch and sip. That's just what my friend, Helen, and I did the other day. It was a delightful lunch. There is a small gift and antiques shop in another part of the building. 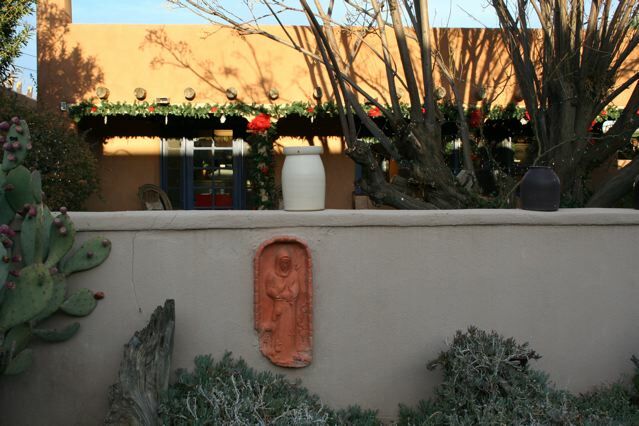 Josefina's also serves as an inn for those lucky enough to stay. Just a reminder: You can vote for any (or all) of my entries in the New Mexico Day of Enchantment photo contest every day. The camel, especially, needs your support as he was a late entry! Go to the main page: http://www.dayofenchantment.com/. When you enter the site for the first time, you will be asked to register. Once you have done so, you can vote for any pix. My five are at http://www.dayofenchantment.com/entries/46443. Thanks for your help. 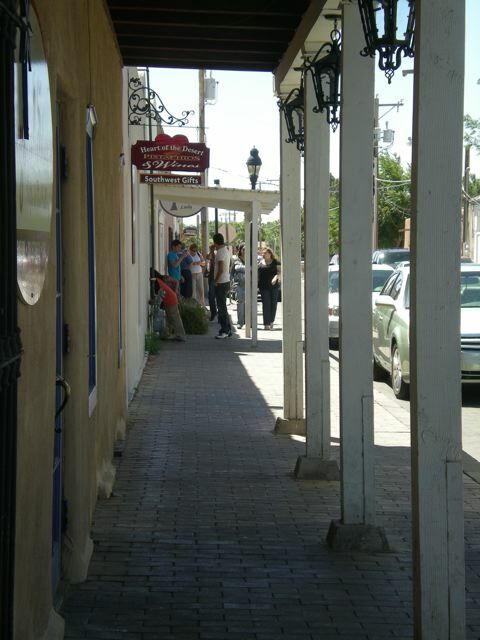 Located in what was once an historic residence, the Double Eagle Restaurant on the Plaza in Mesilla is a real treat. It is filled with history and antique furniture, and it has its own resident ghosts. 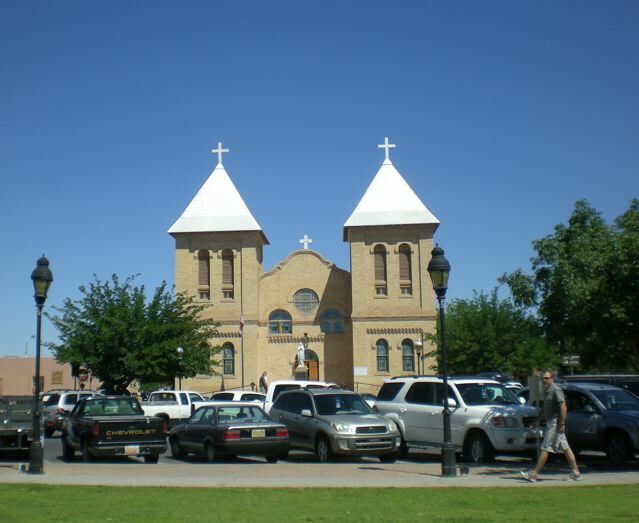 You can read about Mesilla, the Double Eagle, and the ghosts here. The Sunday brunch is nothing short of incredible--all kinds of meats, fried chicken, tilapia in a cream sauce, salmon poached in champagne--and then there are salads, fruits, vegetables, pastries, made-to-order omelettes, and the list goes on. You might take a look at the Mother's Day menu for an idea of what was served to us this past Sunday. Our spread was pretty much the same except for the pork roast, as far as I can see. If you go, make reservations and check the Double Eagle website for coupons. We got one meal for free which wasn't bad, considering the brunch is $20 per person. Plan on wasting the day because, after you've had the meal and the champagne, you'll just want to sit around smiling up at the mountains for the rest of the afternoon. That's what I did. I'm a bit behind on telling you about some of our culinary adventures around Las Cruces, so for the next few days I'll be talking about some of our favorite restaurants. Please don't think we eat out all the time--I've been saving up these experiences from the last month or so. Delicias Café honors the small farm town where we grew up, Delicias, Chihuahua, Mexico. Surrounded on all sides by amazing produce and legendary cattle ranches, every meal was infused with fresh ingredients and authentic Mexican flavors. Prior to opening our restaurants in the United States, we were always on the lookout for Mexican food that reminded us of home - but always ended up frustrated. Either the ingredients tasted canned, or the flavors oddly unoriginal, or the prices ridiculously overpriced. Thus the genesis of Delicias Café, where everything we cook is made fresh daily, from the enchilada sauce to the menudo. Where we believe our customers should experience wonderful, authentic Mexican flavors at very reasonable prices. "Delicias" in English means "Delicious," - and we really hope you agree. From the moment we stepped through the door after walking past the roses in full bloom out front, until we waved good-bye to our smiling and attentive waitress, we had a wonderful breakfast experience. The place was clean, colorful, friendly, and a great place for people watching. I chose the Huevos Divorciados (Divorced Eggs), and I couldn't have made a better choice. It was a version of Huevos Rancheros, with two eggs sunny-side up served on top of fresh (and I mean fresh) corn tortillas with homemade beans and hash browns on the side. The "divorciado" in the name comes from the fact that one egg was covered with green chile sauce, and the other with red. You can check out the rest of the breakfast menu (and lunch and supper) right here. About that green chile sauce--it is still haunting my taste buds. It was unlike any other I have tried and, believe me, you can try a huge range of chile sauces here in Las Cruces. This one was flavored with an herb I have never had before--it imparted a lemony flavor to the sauce and was altogether delicious. Might it have been epazote? I don't really know, but I'll have to go back and do some more on-the-spot research. Please let me know if you have any ideas as to what I was tasting. Update 5/28/10: Auntie Bucksnort and I went back for another breakfast and, thanks to her impeccable taste buds, we now know that the secret ingredient in the green chile sauce is tomatillos! I should have recognized the flavor--after all, I have a recipe for a green salsa with tomatillos over on the recipe blog. 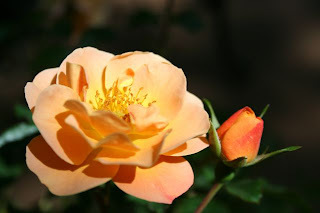 In late May we begin to slow down and prepare for the hot weather to come; we're getting into the summer routine of walking some very early morning miles before the sun is up and trying to get the heavy garden work done before ten o'clock. The patio has become our most important "room." When I get back from the morning mile I have some coffee, read the paper, and do a little sudoku at the tile table under the trees. This is a season of languorous, guilt-free afternoons when quiet work like reading, knitting, and writing are done out in the shade of the big Chinese elms. By mid-afternoon, when the heat sets in, I realize that I'm beginning to understand the concept of siesta and I no longer push myself to do anything too vigorous during that part of the day. The roses and irises and petunias are blooming. The oleanders are coming into their own, huge bushes of red and pink and white. I'm waiting for the gigantic rare* saguaro cactus down the road to bloom. I understand the flowers can be quite fragrant and I can't wait for the experience... No, of course I can wait--this is the Land of Mañana and no one rushes into anything or hurries through the moment at hand. The hummingbirds are here and I have some new feeders set out, following these directions. The tiny birds remind me of aliens as they hover curiously just a few feet from my head, looking into my face. The nights are filled with the songs of toads and crickets. Coming up this weekend is the Southern New Mexico Wine Festival out at the fairgrounds. There will be wine tasting, music, and arts and crafts. I'll take lots of pictures and report back. I suppose I'm like other librarians (and a whole lot of other people, too)--when faced with a task, I'd rather read up on how best to do it, rather than actually starting right in with the project itself. 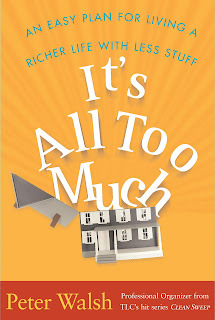 Before I began my spring cleaning, and after looking into hoarding issues, I found this book by Peter Walsh--It's All Too Much; An Easy Plan for Living a Richer Life with Less Stuff. Stop for a minute and close your eyes. Take a little mental drive through your neighborhood. I'll bet you've seen those houses--perfectly nice houses that might be new, or close to new, with a garage so crammed full of stuff/junk/trash that the car, representing one of the biggest cash outlays for most families, is left out in the weather to fend for itself because it simply won't fit in the space that is designed for it. I've even seen garages where the door can't be closed because the stuff is starting to overflow. How did this happen? We are a consumer society, after all, and the combination of our disposable income and an endless supply of cheap goods allows us to just keep on buying. When we run out of space in our houses, there are entire stores devoted to storage solutions, and the self storage industry is one of the fastest growing in the country. One in ten families has turned to the self storage solution (storing goods in a site away from their home) to deal with their overflowing possessions. See The Self Storage Blog for this, and other interesting and worrying statistics. 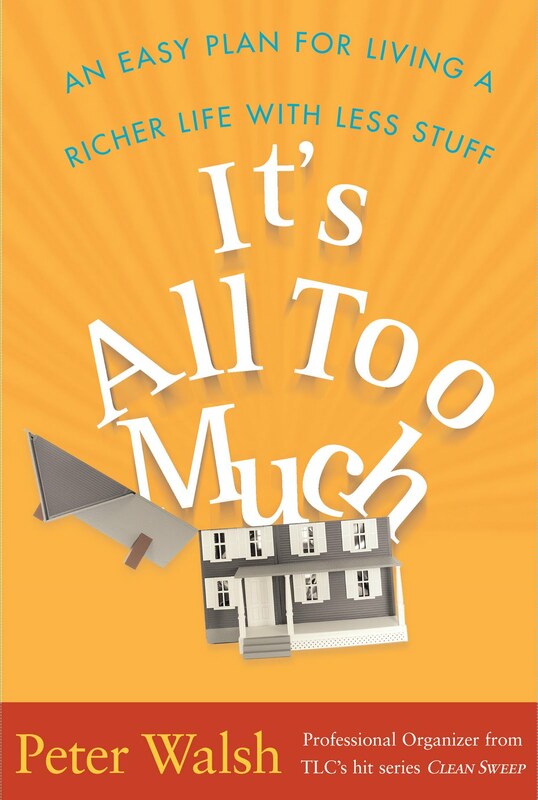 If you are dealing with just too much stuff, you should take a couple of hours to read this book. Here are a couple of Walsh's ideas that I really liked. Look at each room in your house, and ask yourself--What is this room for? What is its ideal function? What should it contain? What has to go? 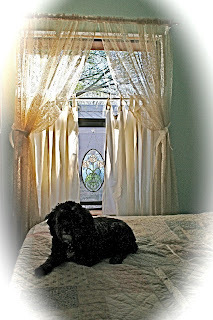 (There are more questions to ask yourself about each room, but these were my very favorites). "You only have the space you have!" Walsh says this again and again, and it's worth repeating. Our family figured this out years ago. Re-stated in Zee-style, it goes: When there isn't any more room in the bookcase, you don't need another bookcase. You need to weed the books and get rid of the surplus, just like librarians do. Actually, as we've gotten older, we've stopped buying books and rely on the library for our reading needs. Our bookcases are getting emptier all the time. Walsh will give you some simple ideas to reduce your possessions--so simple, indeed, that they will remain in your mind long after you have finished the book. For instance, go through a pile of possessions, discarding, say, 2 out of every 5. Put those in your charity/trash/recycling bags. Now, go through what's left, discarding maybe 1 out of every 4. You'll find that it works. One last idea from Walsh. We keep a lot of items because they are connected with memories that we don't want to lose. Ask yourself--is this "precious" item given a place of honor in my home, or is it stuffed out of sight in a molding cardboard box in the cellar? If the answer is the latter, take a photo of the item, and throw it out! Now, you are on your way to a clutter-less home. Think how happy you'll be! It's nice to be back from my little self-imposed blogging vacation. Was I traveling? Was I sick? Nope, I was indulging in some lovely spring cleaning and it was taking up all of my time. Now, I've moved enough times in my life to learn how to lighten the load--with every move, we end up with fewer books, fewer clothes, fewer knickknacks. However, there is always another drawer to straighten up, and another storage box to go through. My usual method of deep cleaning rooms is to empty them completely, paint them, and then only put back the most necessary items, while getting rid of the rest (see Spring Cleaning, My Way). 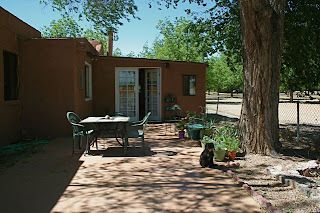 But I'm not really in the mood to paint the adobe house just yet. The walls were freshly painted by the sellers and I'm good with the way they look right now. So--it's time to try out another method. A friend of mine mentioned that her son always watched an episode of Hoarders to inspire him to go out and clean his garage. That seemed like a good plan to me for preparing to deal with the guest room closet, and I recorded just one show for starters. One was enough. As a matter of fact, I had to keep pausing it to leap up and grab another pile of magazines to shove into the recycling container. I would highly recommend the Hoarders method to jump start your cleaning project. 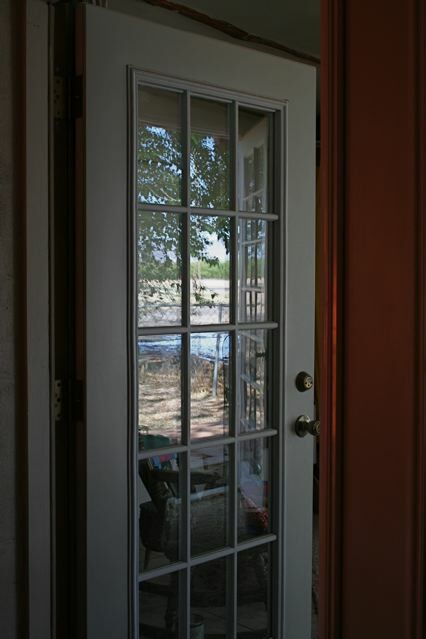 If that doesn't get you going, read this sad story about a woman in Las Cruces who called for an ambulance and had to be removed through a window because the emergency crews couldn't maneuver their equipment through the rooms of the house. What was she hoarding? Rats! I'd hate to give it away. Don't miss the Day of Enchantment photo contest that is running until June 27th. 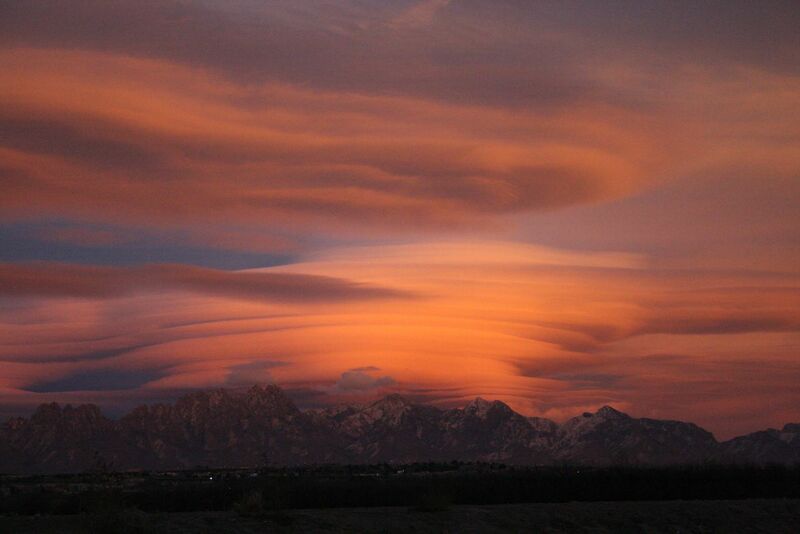 The photos are amazing, and show all areas of New Mexico throughout the day, minute by minute. I entered four photos for the fun of it. I hope you'll check them out and vote for them, if you like them. You can find them here. Be sure to wander through the entries. There are so many I can't imagine that we can view them all, but they really give you an idea of the beauty of this place through the eyes of its amateur photographers. One of my entries was the big lenticular sunset picture above, one of a series that has appeared elsewhere on this blog. 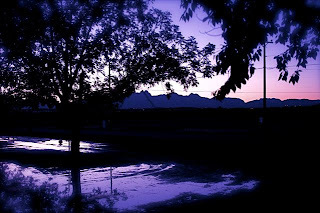 I was sure that it was totally unique, but it looks like several other Las Cruces photographers were out there on that same amazing December evening, shooting away. I've been working hard out in the yard for the last couple of days. Digging, planting, smoothing, arranging, rearranging, then standing back to consider the effect. 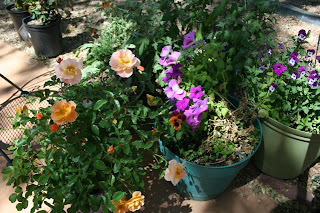 Adding roses, herbs, perennials, and a few bright annuals in the pots on the porch. I need someone to visit! Won't you come over? Come with me to my new patio, shaded by our big messy Chinese elms. 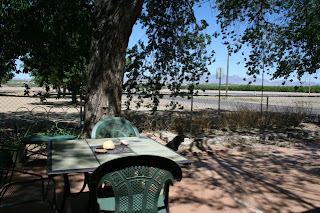 (I have to say that this month for the first time they aren't shedding or dropping anything, just providing beautiful, cool shade where we like to sit and eat, or read, or look up at the mountains). Now, close your eyes. Feel the warm breeze against your cheek. Hear the birds in the surrounding trees--doves, blackbirds, finches, and our resident mockingbird. 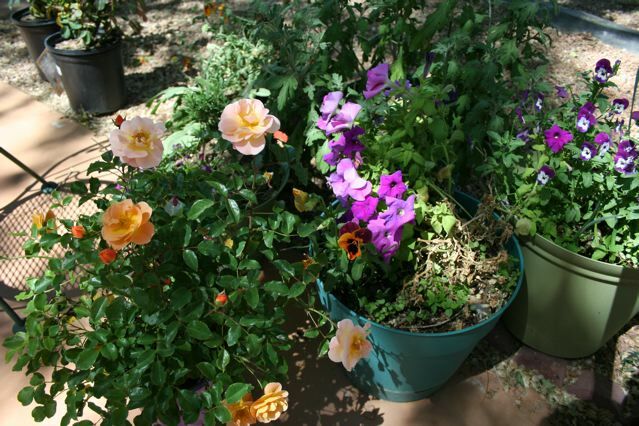 Smell the roses, the lavender, the rosemary, the basil, and the warm May desert air. And today on the patio for your listening pleasure, we have a fountain. 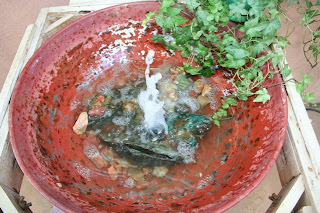 I have to tell you that there is nothing like the sound of trickling water when you live in the desert. It is soothing and cooling like nothing else. 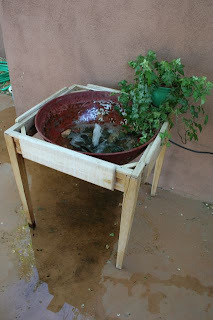 The fountain I just put together is courtesy of my sister, Auntie Bucksnort. She taught me to make fountains years ago, and is lending me this one for a while. Here it is, made out of objects discarded by the original owners--the wooden base of a table and a large rustic-looking metal bowl. 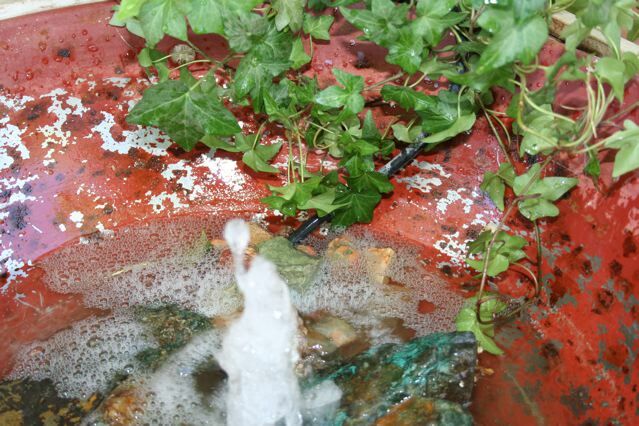 With the addition of some rocks and the purchase of a small water pump from the home improvement store, we have a fountain that provides a tranquil and soothing background for all our birdsong. By the way, the water you see below the fountain is not from leakage or overflow--I had just been watering some nearby plant pots. I added a plant to cover up the spot where the electrical cord comes out of the little pump. If you look really hard, you can see it. Here are a couple of links for ideas about making fountains. Trust me, this is a simple project, so don't be put off by any seemingly complicated directions. Just do it! When we first bought this house, we noticed the patio all right--it was originally a cement driveway leading to what had once been a garage. Even though the former owners had converted the garage to a room with French doors and had painted the cement driveway, and even though there was a view of the mountains, it was cold when we moved in and the patio was full of fallen leaves. I dutifully swept it during the winter, and we bundled up and sat outside to watch the sunsets reflected on the mountains. It was nice, but we had no idea just what a wonderful living space it would be when the weather warmed up. Now it's a spot to drink coffee and read the morning paper. A place to watch the light change on the mountains. A cool and shady place under the big trees. 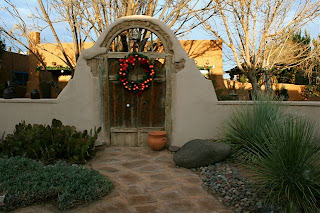 A place to plant flowers and to think about replacing that chain link fence with a low adobe wall. Who knows? The cyclone fence keeps the dogs in and doesn't block the view. Perhaps we'll just plant some flowering vines to climb along it. A wisteria? It's a lovely place to read in the afternoons, to play with the dogs, and to just sit in the shade and think, perhaps planning some future outdoor exercise adventures. Another day, another morning mile. This time I took along my pup, Miss Emma. 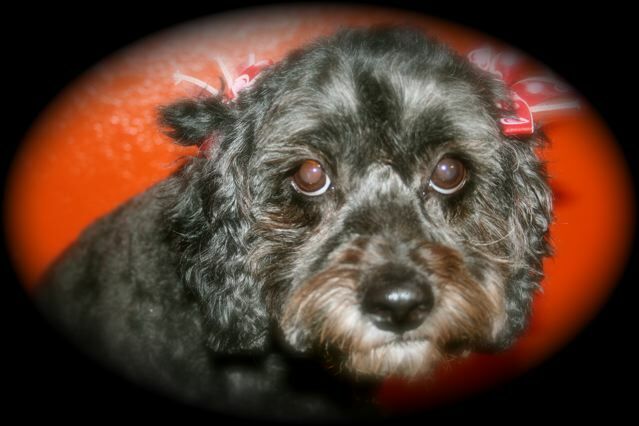 Em was born with bad knees but the vet says that short walks are fun for her and not too painful. Let me tell you, there was plenty of spring in her step this morning when she saw the leash. Keeping those poor knees in mind, we only went as far as the bridge over the ditch. Along the way we saw plenty of other morning milers--young folks walking dogs before work, older retired couples, and a rosy-cheeked lady on a bike. This is the view from the bridge looking north, the opposite direction from yesterday's video. It gives you some idea of the birdsong and tranquility of the mornings here, even though you can still hear the ditch pump working away behind me. 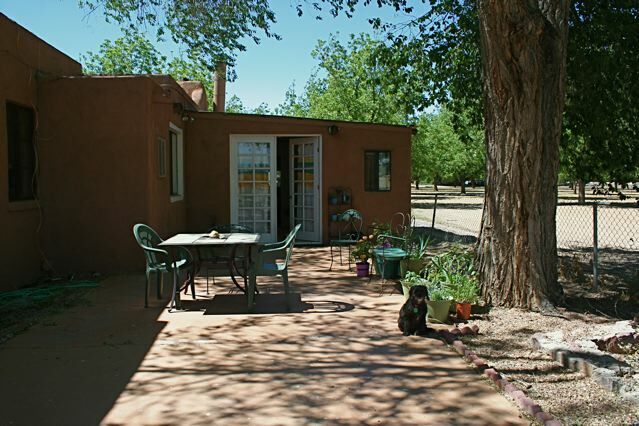 You will see the trails alongside the full ditch, some recently hayed fields, the Robledo Mountains in the distance, and one of my favorite adobe houses in the neighborhood, surrounded by blooming roses. Oh, and the chile sign, of course--I had to put that in there right at the end for those of you who are far away and longing for our hot green chiles. I actually used the zoom feature on my little Flip camera so that you could read the sign, but I wobbled too much and had to take out that part of the footage. I love that phrase, "the morning mile." I first came across it on Andy Baird's website, Travels with Andy, when he mentioned that he always takes a walk in the morning--his "morning mile." For some reason, that stuck with me and, on all the mornings when I was talking myself out of getting outside for some exercise, I would imagine that I could hear Andy, saying in a matter of fact manner that he was heading out for his morning mile. So why didn't I do the same? Of course, once I got started, I found that I wanted to go the distance, and even a little more. So, now my morning mile is actually a morning mile-and-a-half, and it passes through some lovely country, with views of fields, gardens, mountains, and horse pastures--places where something is always going on. 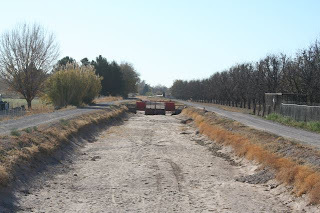 When we first moved here, I showed you a photo that I had taken of the then-empty big ditch that runs through this agricultural area, and said that I hoped to be able to show it to you when it was full. I didn't realize that during the growing season the big ditch is always full and farmers on either side of it open gates to flood their fields and orchards whenever it is their turn. 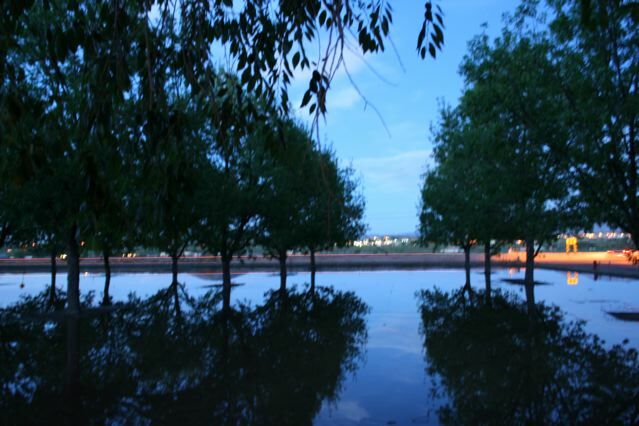 One night while the orchard around our house was still flooded (see Waterfront Property in the Desert?) 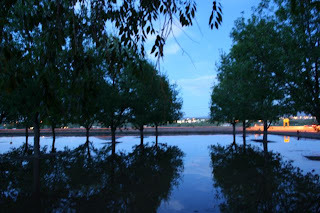 the blues were so intense and the reflections so wonderful that I was determined to get some photos. This meant rolling out all the skills I had learned about (as opposed to skills that I have actually acquired) in my Digital Photography course and (gasp!) shooting manually, rather than with automatic settings. However, night shooting takes a long exposure and no matter how hard you try to stay still--arms clamped to sides, feet planted widely, and breath held--a 10 second exposure is like infinity and is way too long to be perfectly motionless. Nevertheless, I just had to try. The results? The blues are there, the reflections are there, and I even included a couple of passing cars on purpose (you can see the red streak from the taillights in the last two photos), but there is the inevitable shake and lack of pure focus that becomes quite clear when you click on the photos to view the slightly enlarged versions. However, should you be viewing the pictures from the back of a galloping horse you might not notice those imperfections, especially if you have left your glasses at home. Little Bertie's cousin Spike has been working on his flossing. 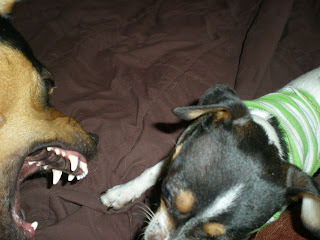 Here he shows Bertie the results of his improved dental hygiene. 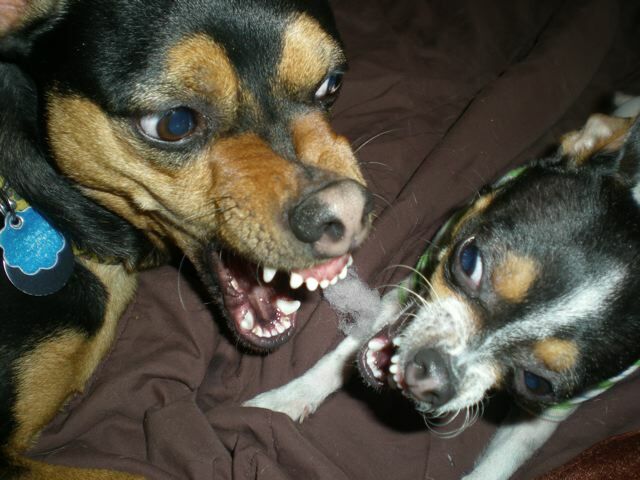 Bertie has to show Spike how to open really WIDE. Very nice, boys. I think that the dog dentist will be quite pleased with both of you. 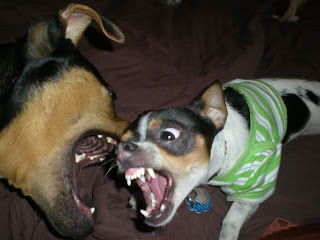 (Seriously now, isn't that last one the funniest photo ever? Thanks to Auntie Bucksnort for this marvelous series of scary looking shots). 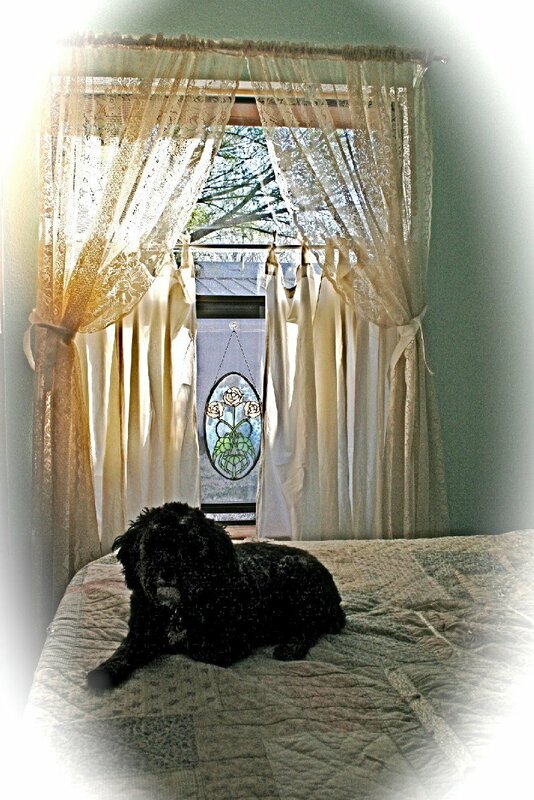 For more about Bertie, see The Adventures of Bertie Pierre. Waterfront Property in the Desert? My first clue this morning that something unusual was going on was this reflection in the door... Wait, what's that blue stuff? 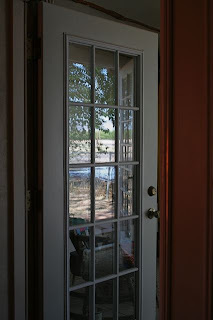 Stepping out onto the patio for my morning dose of mountain views, I saw that we were surrounded by a lovely lake. 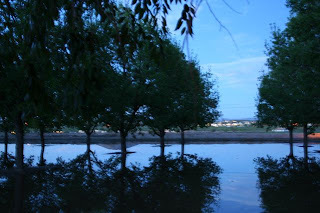 I have been looking forward to seeing the orchards around our property being irrigated. 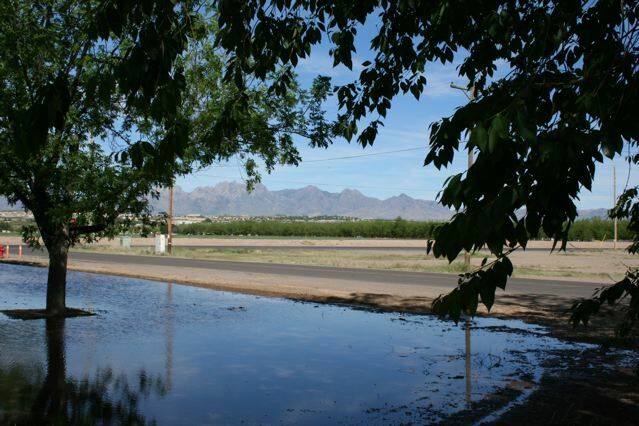 If you have ever traveled through this part of the country you will know that the pecan orchards (and some lawns, if the owners have irrigation rights) are simply flooded in order to water them. The birds and the occasional duck are very happy. If you turn up your volume to view this video you may hear robins, doves, and perhaps even a red-winged blackbird. 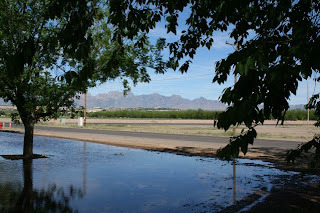 Faraway people who may picture the Chihuahuan Desert as a dry and dusty place have no idea how lucky we feel to live in this beautiful oasis, the Mesilla Valley. For those of you who are Las Cruces fans, here is an update on what life is like here in early May. We've experienced BIG winds and blowing dust, pretty typical for early spring here. We were away last week and came back to some big branches blown down, with one hanging over wires. Our hero, Beez, was able to finagle that big one down without harming the side of the house, the bedroom window, or the breaker box on the exterior wall. Then, sadly, one of the branches loaded into the pickup shifted and broke the back window of the truck. $8.00 at the dump for 2 loads of branches, $526 for truck window repair. 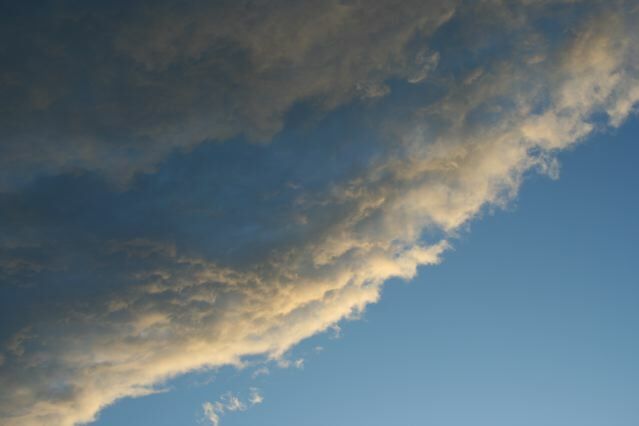 The winds seem to have subsided and the weather looks great for the next couple of weeks--cool nights and early mornings in the 50's, and days in the high 80's. We're in that wonderful part of the year where we don't have to heat or cool the house for several months. The roses are in bloom everywhere, even in places where they are obviously neglected. I'll get photos, I promise. I missed out on the lilacs while we were away the last couple of weeks. This is also a prime iris-growing area--I'm starting on a collection here and will let you know when mine begin to bloom. The ditches are running full and the crops are coming up in fields all around us. I recognize the onions, but are not sure which are cotton and which are chiles. I'll learn as I go. The pecan trees are all leafed out, which may be part of the reason why today has a pollen alert. 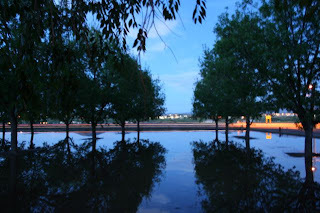 I still haven't been here when the orchards are flooded--that's how the trees are watered--but my sister tells me that it's like living on an island, ducks and all. The Las Cruces Farmers Market is bigger and better than ever. 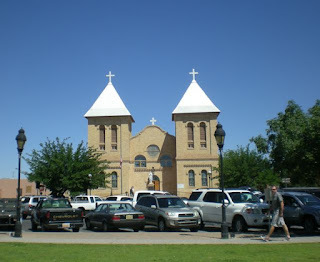 The March 2010 New Mexico Magazine calls it "vast, gregorious..." and a place where they "passed hours admiring and shopping." 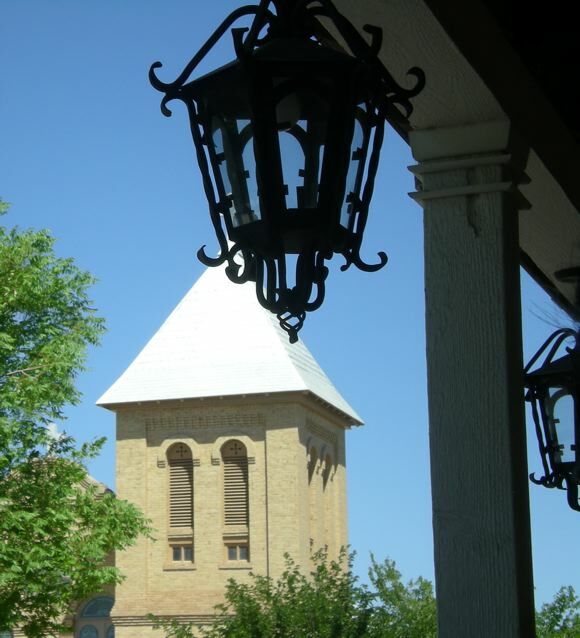 If you get a chance to look at the print edition of the magazine, by the way, check out the article Fiery Feast--Breakfast, Lunch, Dinner: Las Cruces & Mesilla. It reviews some of our favorite eateries--The Shed, Nellie's Cafe, and the Double Eagle Restaurant--and the Preston Contemporary Art Center, which is on our list of places to visit. While we were out of town, we missed some notable happenings, which we will surely attend the next time they come around. The first was the White Sands Moonlight Bike Ride, a 16 mile ride through the National Monument at night under the full moon, over roads closed to other traffic. We could have rearranged our schedule, but the ride filled up so fast that it was closed on day 2 of the online registration. Ah, well, it was pretty windy out there that night. The second big event we missed was the La Viña Blues and Jazz Festival down at the La Viña Winery in La Union. We used to go to these festivals when we lived here a decade ago, and never forgot the wine, the music, and the great ambience. 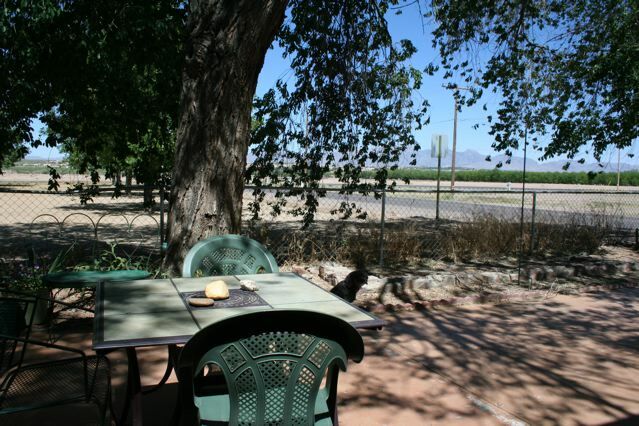 Don't worry, though, we'll be going down to the winery this summer for picnics and music on the patio. 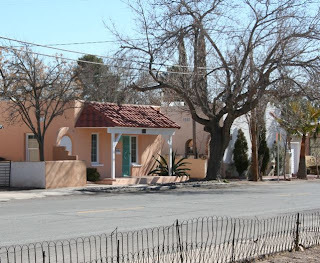 I really regret missing out on the third event--The Las Cruces Symphony Guild Home Tour in the Alameda Depot Historic District. I would love a chance to see inside some of the wonderful homes down in the Alameda. I've spent a bit of time doing my own walking tours there and photographing the outside of houses--see A Walk Around the Alameda-Depot Historic District, Parts 1, 2, and 3. I've given you plenty of links here to explore. In the meantime, I'll be catching up on reading the newspaper to find out about upcoming events, and will report back. Since I've been thinking about getting rid of that expensive cable TV service, I've been poking around the Internet to look at some alternate entertainment ideas. Here is one for us all: Radio! Listening to radio via laptop is the perfect thing for me to do while working on something else--knitting, sewing, cooking, or riding the exercise bike (lol!). You can listen live, stream audio from the archives, or download and play the shows somewhere else on your portable .mp3 player. I've tried out a few programs in the last week or so, and have been vastly entertained, while learning a lot. So, here is my beginning list of radio on the Internet. 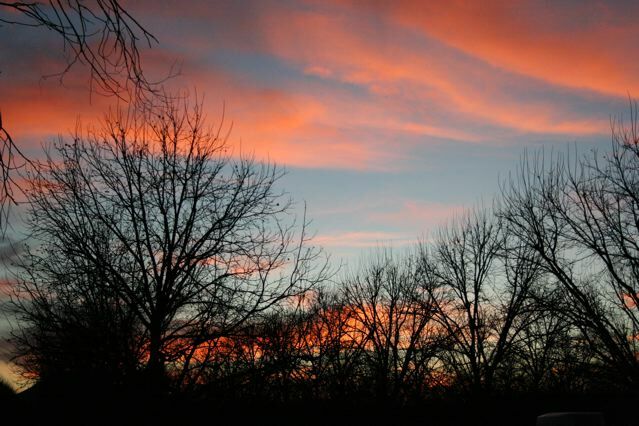 If you have other favorites, please chime in via the comments. I've always loved listening to this show live on National Public Radio, so it was the first one I turned to. Check out the radio archives, and you find programs all about [the darker side of] Babysitting (some pretty funny stuff that will make you gasp); True Urban Legends (Can a rat really come up through your toilet? Are there really alligators in the sewers? ); or Origin Story, about how all kinds of institutions got their beginnings. Radiolab from WNYC brings you culture, news, shows, and music. Here is what they say about themselves: Radiolab believes your ears are a portal to another world. Where sound illuminates ideas, and the boundaries blur between science, philosophy, and human experience. Big questions are investigated, tinkered with, and encouraged to grow. Bring your curiosity, and we'll feed it with possibility. (Thanks to my son for suggesting this one). Limits - "a journey to the edge of human limits to find out how much the body and brain can endure"
Lucy - "chimps, bonobos, humans... we're all great apes..."
Animal minds - "...what goes on in the minds of animals..."
Numbers - "where do they come from and what do they do?" From National Public Radio, On the Media explores how the media 'sausage' is made, casts an incisive eye on fluctuations in the marketplace of ideas, and examines threats to the freedom of information and expression in America and abroad. For one hour a week, the show tries to lift the veil from the process of "making media," especially news media, because it's through that lens that we literally see the world and the world sees us. I love the part about "threats to the freedom of information and expression," especially after my own brush with cyber-terrorism this week. The newest listings, for instance, include reports on iPhone leaks, Goldman Sachs, cyberwar, and North Korean propaganda. RadioLovers is a kick! 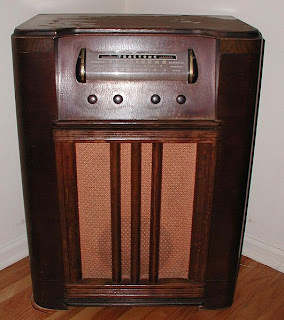 Whether or not you remember hearing the really old-time radio shows, you can experience the good old days here, commercials and all. I listened to Father Knows Best (really funny to consider how far women have come...), but next I'm going to try Flash Gordon and Hopalong Cassidy. Hoppy was always a big TV favorite with me. Science Friday is a weekly science talk show hosted by Ira Glass. I listened to a show on E.O. Wilson's book, Anthill. It was fascinating to hear how an author of non-fiction books made to switch to writing this work of fiction. Looking through the archives, I see shows on infection (yippee! ), the Hubble Telescope, wind power, tornadoes, beekeeping--the list is, indeed, endlessly fascinating. The only way I can figure to get around these weird stalkers is to make the blog available only to friends, longtime readers, and family. I'm sorry that you need to use a password to get in, but I'm glad you decided to keep reading. Now, if I can get through the rest of this teenage-sounding saga and delete the remaining incoming hate mail, we'll return to our regular programming in a day or so. Thanks for your patience. [Later note: The blog was returned to public access May 4].